A beautiful mountain, not very well know to many people who would normally prefer to relax on the beaches below. It is a protected reserve with significant flora and fauna. Its forest is ideal for walking and biking trails as there are comfortable roads and paths and many signs. At various points you may admire marvelous views either towards the Toroneos bay side or towards the Agios Oros bay side which is dominated by the imposing form of Mt. Athos. The local name of the mountain is Dragoudelis, or Dragdels. It is worth going to the mountain top at 823m. 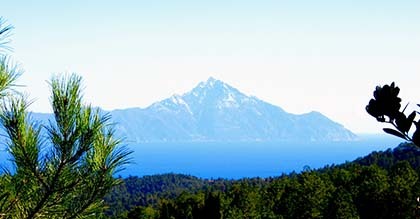 There is a wonderful view of Halkidiki and the Aegean Sea. There are a lot of beehives in the area, so you will meet a lot of bees in your way. The mountain can be also crossed with an all-road car. In the central forest zone, close to the mountain top, there are some rare old Itamos trees. Typical mammals that live in the mountain are wolves, foxes, rabbits and wild pigs. Probably there are some deer left. Vourvourou – Askamnia – Parthenonas 18km. Agios Paylos – Askamnia – Parthenonas 18km. Agios Paylos – Psaria – Mountain top 14km.